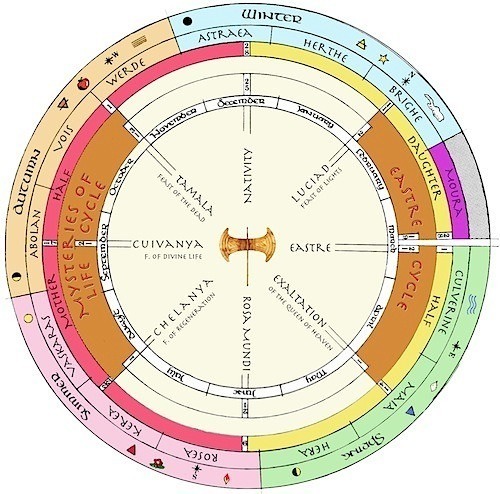 If you look at the Wheel of the Year, you will see that Luciad, the Feast of Lights, is the first festival of the Eastre Cycle – the uppermost point of the Eastern Blade of the moon-axe (and naturally the verbal similarity of Easter and Eastern is no mere coincidence). 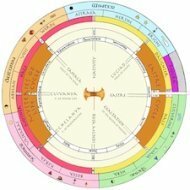 The Luciad Festival is seen as the beginning of the end of winter. It marks the final end of the full Nativity season in those places where a "long Nativity" is celebrated, and traditionally it is bad luck to have any Nativity decorations still in place on the Feast of Lights. The year now moves into the next phase of the Great Cosmic Narrative: in which God the Daughter has grown to "the full stature of maidenhood", as the Scriptures phrase it and is ready to undertake of her own free-but-perfect will the greatest of all sacrifices and the bringing of the light. 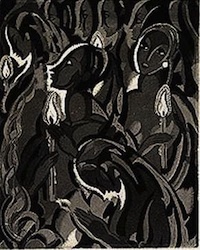 The Feast of Lights is the year-manifestation of the Taking-on of Fate of God the Daughter: Her undertaking to carry the Light of the Mother into every part of manifestation, even to its lowest and darkest levels – and to the very Realm of Death. In doing this the Daughter is taking on mortality, an act that is seen as parallel to the Bodhisattwa's Vow taken by Quan Yin. In each case, a Being who is inherently Divine puts aside Her own Divinity for the salvation of beings. And since there is only one Divinity, we may see these two stories as two different perspectives on one universal Truth. At the Nativity, the Daughter is born as a being separate from Her Mother. At the Feast of Lights, She takes on, of Her own free will, the fate (or fatality) that will ultimately lead her to pass through the Seven Gates of the Nether Realm and to suffer death at the lowest point of the World Pillar. This is the primary festival of the Daughter as Light Bringer. The Solar Light of the Mother is too great for a fallen world to look upon, and so the Daughter brings Her Light to the world as the Lunar Mediatrix. This naturally coincides with the waning of winter and the promise of new light. As the Great Light Festival, the Feast of Lights, is the day for the blessing of candles, and ideally, if one uses candles on one's shrine, one should have as many as one needs for the coming year to be blessed at Luciad. However, the symbolic blessing of whatever candles one has is considered adequate if this is not possible. The traditional flower of the Feast of Lights is the snowdrop, which is usually the first flower of the year and may even, as its name suggests, bloom in the snow. 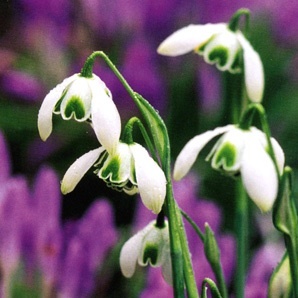 The white purity of the snowdrop betokens the promise of new light, both natural and spiritual – and of course the two kinds of light are not separate phenomena, since the natural world is the echo of the spiritual Realities that underlie it. I have often heard the Daughter's Taking on of Fate equated to Quan Yin's Vow. I am sure this is correct, but I have a question. Quan Yin's vow is not to enter Buddhahood (oneness with the Divine) until every being is saved "even to the last blade of grass". However, the Daughter, while She goes down unto death, is ultimately raised up as Queen of Heaven. Can you shed more light on this? Thank you for raising this point. What we must bear in mind here is that Myths, which are far profounder than mere terrestrial history, are in fact four-dimensional snapshots of Realities that lie beyond dimensionality – in other words, Transcendent events presented to our understanding as if they were events in time and space. Since we are space/time-bound creatures this is the only way we can perceive them. The primary difference between the "angle" or "perspective" of the Quan Yin story and the Gospel is that of time. In the first place Quan Yin is seen (at least partially) as a human who attains Buddhahood, but refuses it, while the Daughter is Divine from the beginning. Now in fact, Quan Yin is a Goddess assimilated into Buddhism, but even leaving this aside and speaking purely within the logic, or "economy", of Buddhism, the difference between the two perspectives is illusory. Once a being has attained full and ultimate Buddhahood she is Divine and is (one with) the only God that Buddhism acknowledges (and we accept this as a valid Spiritual perspective, although not ours). So the refusal of Buddhahood and the separation of the Daughter from the Mother are two ways of expressing the same thing: the paradoxical separation of the Divine from the Divine, for the salvation of beings. The Daughter is certainly raised up as Queen of Heaven after Her Resurrection, but She remains the Daughter. She is not assimilated into the Mother. And She is the Preserver of the Worlds. It is only through Her that the Mother's creation may continue in existence. She will continue to sustain the worlds, and to guide Her children, until all beings are reunited with the Mother, "even to the last blade of grass". We may also note that the original perspective is never far from the surface. In folk-tales about Quan Yin, She is indeed killed, descends to Hell, liberates the souls there and rises again. While these may be dismissed by High Buddhism as mere peasant tales (or more likely by arrogant Western scholarly Buddhists – eastern Buddhists tend to have more respect and more understanding of the subtleties of spirituality) – what they show is the ultimate unity of the two perspectives. 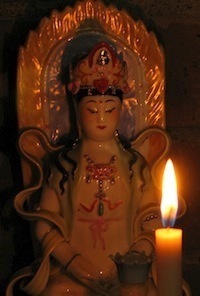 Learn more about Quan Yin here.